On this date in 1415, on the eve of the Battle of Agincourt, the young English King Henry V approved the execution of his onetime boon companion Bardolph in William Shakespeare’s Henry V.
18th century illustration of Bardolph. 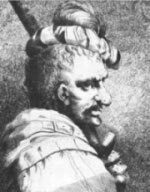 The fictional Bardolph had been the ruddy-nosed friend of Henry’s in the Henry IV plays (Part 1, Part 2), where the hard-drinking, rabble-rousing young prince is a disappointment to the father who fears his heir will never merit the throne. By Henry V, the boy has become the ruler, and launched an audacious incursion into France during the Hundred Years’ War. Hal’s willingness to own the rough decisions of statecraft — in this case having his friend put to death further to his win-French-hearts-and-minds policy — is part of his coming of age as Henry V.
Whether that means Hal’s maturation into regal dignity or the corruption of his humanity by power is up to the reader. How now Fluellen, cam’st thou from the Bridge? What men haue you lost, Fluellen? Gamester is the soonest winner. * As quoted in the very apt 1992 “Shakespeare’s Henry the Fifth and the Law of War” by Theodor Meron, American Journal of International Law, vol. 86, no. 1. That’s not the Olivier version, but the BBC version.